Do you remember Geronimo Stilton: Flood Mission? Geronimo is so funny! My favorite part is when Tony Sludge throws a cord at Geronimo and knocks into him right before he activates his rain triggering device! Another of my favorite parts is when Geronimo says "I'm not cut out to be a hero mouse!" Wait, I'm not done yet. It's so funny when Geronimo eats that sandwich with HOT PEPPERS! Oh isn't it funny when Geronimo thinks that Tess Technopaws is giving him gum? Benjamin brought that piece of writing home from school and it completely enchanted me. He said that Issac is a boy in his second-grade class, but that he didn't ever deliver the letter to him. "For some reason, we didn't share, even though the letters were addressed." 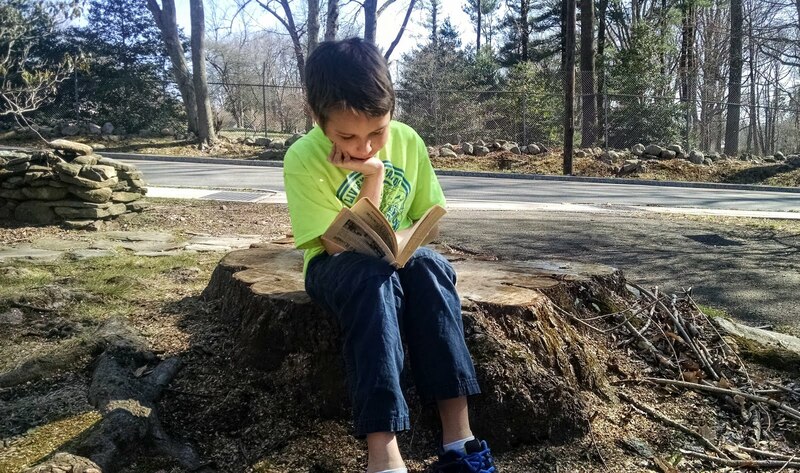 Anyway, I couldn't resist posting it, along with this picture of Benjamin reading outside on Saturday. (Three cheers for springtime!) I particularly loved reading this letter because I've never really gotten into Geronimo Stilton books. Not my scene, at this point in my life. So I loved learning that he found them very funny and action packed. I also loved reading his invented spellings. The original document has gems like "dvice" and "samwice." I kept his all-caps on the hot peppers though! I asked Benjamin if the Heromice series of Geronimo Stilton was different from the original. He said, "Kind of. Tony Sludge is the bad guy and all the hero-mice are trying to defeat him." Sounds to me like the Geronimo Stilton series has some different story arcs within the larger series. I know Magic Treehouse does. Benjamin says he'd give the book 4.5 stars, out of 5. My 8 year old LOVES Geronimo Stilton! He says things like "fabumouse" at times, and has read stacks of them. (Good thing there are stacks of them available!) I've read...maybe 2. That was enough for me. I can see the appeal, though! Haha! I didn't know "fabumouse" was a thing.